On the trail: The view from Dobroyd Head, seen from the Spit to Manly walk. Australian Traveller magazine intern Jemma Fletcher laced up her hiking boots to explore Sydney’s ’16 National Landscape’. With Sydney Harbour recently becoming Australia’s 16th National Landscape, according to Tourism Australia, it’s a refreshing reminder that the city’s spectacular coastline is just minutes away. I took up the invite to explore one of its most beautiful routes, the Spit to Manly 12km walk, operated by Sydney Coast Walks and guided by its founder Ian Wells. Born and raised in the Sutherland Shire, Ian takes great delight in sharing his ‘backyard’ with you. His extensive knowledge and contagious enthusiasm about this scenic walkway is evident throughout the day. The morning begins at Circular Quay with a private water taxi across the famous harbour to the Spit Bridge. On arrival, we walk past an array of desirable harbourside real estate that has every member of the close-knit group looking around in admiration. As we make our way across the first of many secluded beaches, Ian points out one of the last floating boathouses left in Sydney Harbour. During the depression in the 30s, there were 32 houseboats moored in Middle Harbour, yet unfortunately, only four remain apparently due to the belief that they are an eyesore. Of course, no trip to the beach is complete without a traditional game of cricket, which rejuvenates the group ahead of more variable terrain coming our way. Urban pathways, tracks of wild coastal heath and dry eucalyptus forests are prevalent along the route, which adds colour, variety and an interesting insight into which plant life inhabits the area. My favourite flower en route has to be the russelia equisetiformis, also known as the Firecracker Plant, because of its explosive display of red, narrow, tubular petals. Just before lunch, we detour away from the route slightly to pass through the beautiful Grotto Point Engraving site which showcases an assortment of ancient Aboriginal rock engravings. These carefully drawn sandstone images have faded with time but are still an impressive sight. 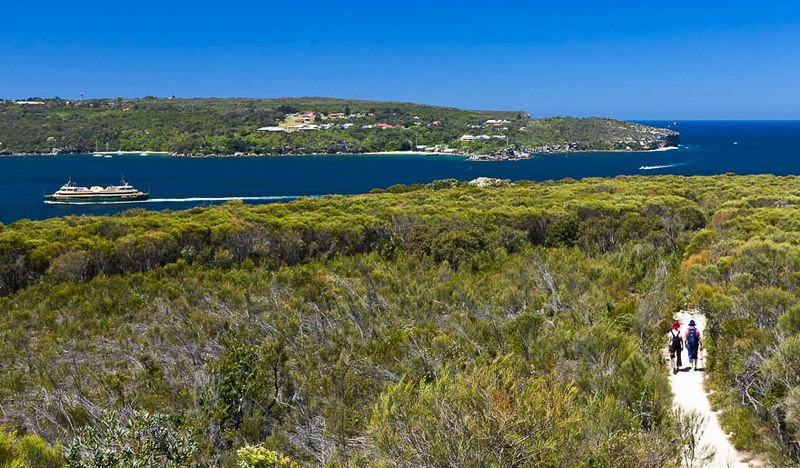 Further ahead, we stop at Dobroyd Head Lookout which has an elevated 270-degree outlook of the harbour. This spectacular view of Port Jackson is accompanied by Ian’s fascinating stories about the first European settlers in Australia. It is speculated that when the Indigenous Australians first made physical contact with the Europeans, they peacefully approached them at the beach in which they were camping. Ian points out where this beach is situated and gives us a first-hand narration of the historical interactions that occurred, which have been passed down to him by an Aboriginal Elder. For the remainder of the afternoon, we enjoy tree-lined views and walk at a relaxing pace through Esplanade Park, followed by a leisurely return on an iconic Manly ferry. This walking tour has certainly opened my eyes to explore Sydney Harbour’s possibilities. NB: Jemma was an invited guest of Sydney Coast Walks. Cost for the full day is $159 including lunch, a “goody bag” and a return ferry ticket back to Circular Quay. For more information see sydneycoastwalks.com.au. 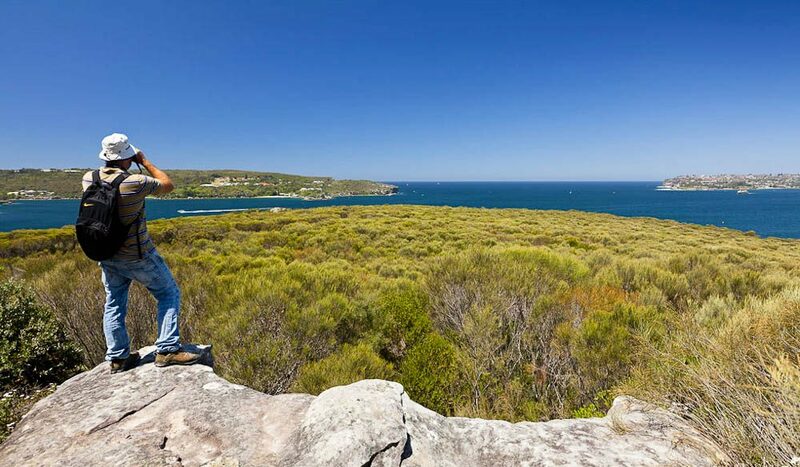 Great review of the Spit to Manly coastal walk! I am heading to Sydney for 3 weeks in Novemeber and would definatley consider giving this Guided Walk a go. My wife and I have done this walk twice before and both times we were lucky to have perfect weather. Being from “the shire”, it was great to see parts of the harbour city from so many vantage spots that we definitely don’t get to visit often enough. On both occasions we drove to The Spit and parked just on the Manly side of the bridge. As this walk is fairly popular, an early start is an advantage as the parking is not generous. On both occasions we rewarded ourselves with lunch at The Steyne Hotel which is on the beachfront. It has a really big bistro area which has great food and is good for families as well. Getting back to the bridge is very simple, just head back to the ferry wharf and catch any bus back to the city and hop off at the bridge, easy.